The Golden Army Must Not Be Awakened! They're like the spiritual opposite of Lawn Gnomes! There is a lot of weird stuff in the Storm Peaks, but this one I stumbled on when running Halls of Lightning and while waiting for a new tank via LFG (the first tank bailed after downing the first boss. We presumed he only needed one Emblem for something.) I decided to wander around the Unyielding Garrison (First big room) and take a look around. Below the small platforms extended in mid-air, I found a legion of massive Iron Vrykul standing around. They certainly didn’t seem animated, or at least I don’t recall seeing them move any. They just stand there in formation. The other thing that caught me was the size of them. 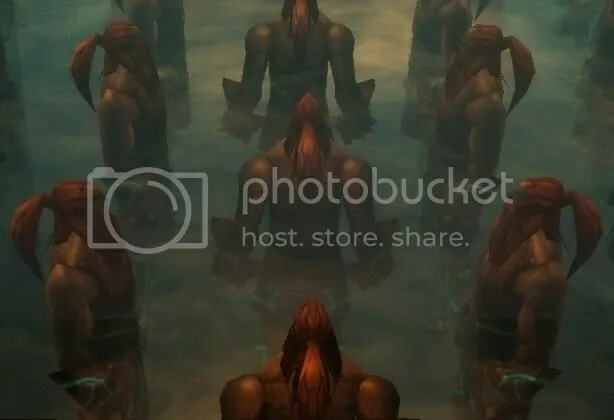 I mean, we’ve seen Iron Vrykul in different places before, but they tended to be about normal Vrykul height if not a little bigger (Runemaster Molgeim in the Antechamber of Ulduar is the biggest I believe) but these things look big enough to dwarf the elemental giants in the Vault of Archevon. So I’m wondering why the heck were these massive metal behemoths ever used? They might have come in handy in defending Loken, and certainly Ulduar. They could simply be a metaphorical decoration. Something like the Chinese Emperors that are buried with an array of stone statues of soldiers. It would explain why they are arranged in such a neat and organized fashion down there. But would the titans really devote that much resources to making a frivolous group of statues that serve absolutely no purpose other than to show off? Well, yea, I suppose so. I mean look at all the stuff in Ulduar. It’s a prison for an Old God… decorated with lavish statues and holograms of constellations. The whole place is kind of like constantly flipping between Oz and Lifestyles of the Rich and Famous on TV. My guess would probably be that they need something to be woken up, like an activation code, that Loken (and thus his master, Yoggy) didn’t have. Which must have really been a bummer for someone like Loken who seems to really get a kick out of having a power trip. A massive army of huge metal soldiers that could wipe out any and all threats and ensure that the Old Gods release is ensured? Awesome! But you don’t have the keys. $#%*! Maybe Loken didn’t want to activate them either. After all, Ulduar was built for the expressed purpose of keeping Yogg-Saron sealed away. Maybe this army was meant to be a contingency in case of Yogg-Saron breaking free (or his servants attempting to break him free). But it was never activated because Yoggy brainwashed all the Watchers so they couldn’t turn on the safe guards. Whatever reason it is, it really has got me wondering how much of Ulduar we didn’t see. If there is a giant storage room with nothing but huge soldiers, what else could be stored within the depths of that place? Even the dwarves of the Explorer’s League had thought that Ulduar was an entire Titan City. Is there a cafeteria for the Watchers? How about a game room? Must get boring being there all day. Oh! Maybe there’s an off shoot of Hodir’s area that has a fridge in it! Maybe some Titan Ice Cream? LF9M to Raid the Fridge! Posted on March 19, 2010, in Northrend, Oddities and tagged halls of lightning, loken, statues, ulduar, yogg-saron. Bookmark the permalink. Leave a comment.